Pink lemonade is a beverage that looks so beautiful and is perfect for any girly parties or to serve when you have your girls over. 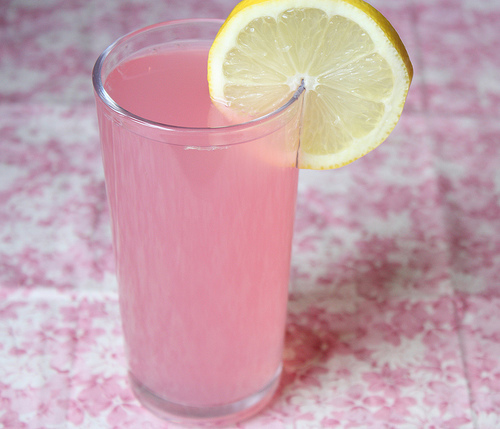 I always wanted to make pink lemonade and only recently found out how easy it was so thought I would share my favourite recipe with you! I tried a few different ways and found this recipe creates the best taste and colour! Step #1-Bring granulated sugar and 1 cup of water to boil in a medium pan over high heat. Stir until sugar is dissolved. Refrigerate until chilled, about 1 hour. Step #2- Add lemon juice, superfine sugar, cranberry juice and 1 1/2 quarts water to serving container. Stir until sugar is dissolved. Refrigerate until ready to serve. Step #3- To serve, add ice cubes to fill a tall glass and garnish with lemon slices. * You can add raspberry or strawberry essence to enhance the flavour. * You could add a tiny bit of pink food colouring to enhance the pink colour. So that's how easy it is to make this super cute and delicious girly drink!